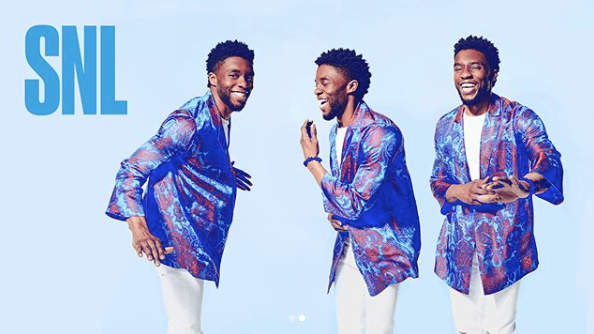 Chadwick Boseman's film the 'Black Panther' has become the third highest grossing film of all time with over $1billion. While he has already conquered Hollywood, the actor is leaving his mark in fashion. On Saturday(April 7th) he hosted Saturday Night Live with musical guest, Cardi B. He did an amazing job hosting and he also brought his style A-game. 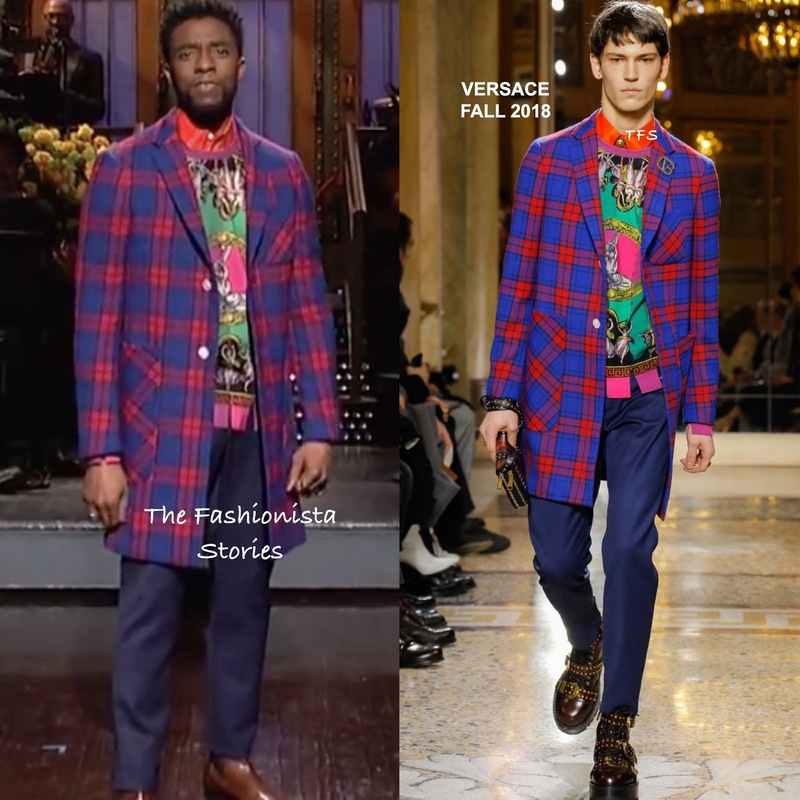 For his opening monologue, he rocked a VERSACE FALL 2018 plaid overcoat, a orange button down shirt, a colorful printed sweater and navy trousers. Love this look head to toe. The colors are amazing against his skin and it was the perfect opening look. The hem on the sweater is odd but he pulls it off. DAVID YURMAN jewelry and CHRISTIAN LOUBOUTIN brown chelsea boots out his winning look. 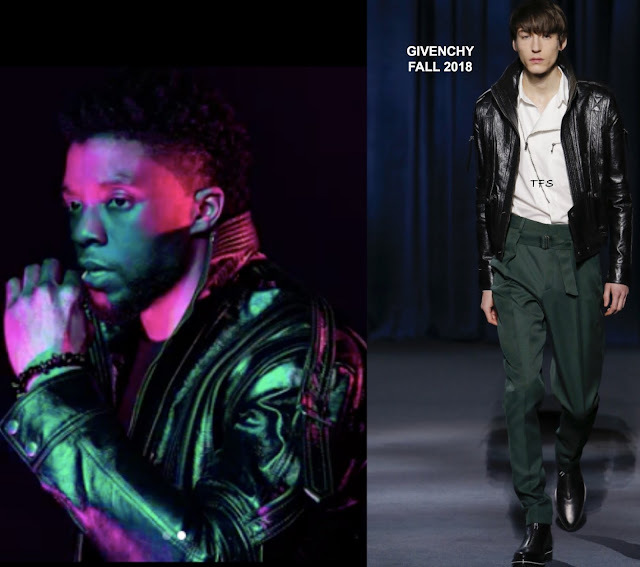 For one of his prom pics, he rocked a black leather GIVENCHY FALL 2018 moto jacket with a basic black tee shirt underneath. I don't even need to see the full look because he nailed it again. Love the edgy, cool vibe that he is serving up here. I am from South Carolina like him and the toothpick in the mouth reminds me of home because the guys there do that a lot. 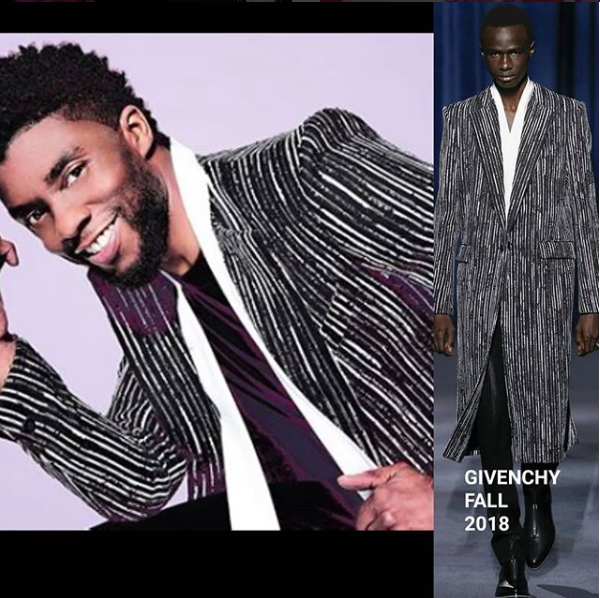 For another promo pic, he turned to GIVENCHY once again, wearing another FALL 2018 piece. This black & white overcoat just looks great on him. The fashion relationship that he is building with Givenchy is proving to be a great one and I hope it continues. For another promo look, he rocked a blue & orange floral print, silk robe by ETRO which was teamed with a white tee shirt & jeans. I like that he never plays it safe with his fashion choices. He plays around with prints & colors which makes him a standout on the carpet. His stylist Ashley Weston knows how to pick the right jackets for him. He continues to be the top fashion man to watch. The Versace and the Givenchy overcoat are my favorites here, which are yours?